Long silky ears, Madonna glance from velvety eyes - cocker spaniels are sensitive, affectionate, intelligent, spirited and cheerful. The small hunting dogs were originally bred to hunt woodcocks, before their career as a popular and adaptable family dog began. They need regular activity, love retrieving games and long walks, and like to swim. 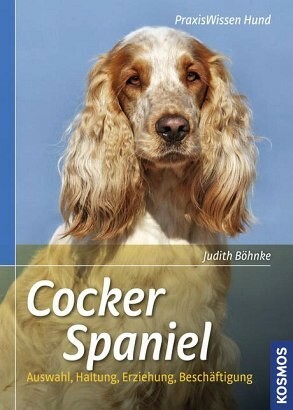 Dog expert and breeder Judith Böhnke describes how to keep a cocker spaniel, train him, care for him and keep him healthy. Judith Böhnke studierte Rechtswissenschaften und Ethologie, arbeitet als Fachjournalistin und Hundetrainerin und ist Mitglied im Verband der Tierpsychologen und Tiertrainer e.V. (VdTT).